Brian: Thank you for taking the time to answer my first questions. First off, could you please give us a description of just what BorderSpace is, and why you think people will play it? Chris: BorderSpace is a massively multiplayer game with elements of combat (PvP & PvE), gathering, crafting, manufacturing, an open market, conquest, and colonization. I’ve seen the description of “Eve with joysticks”, which is a bit of an over-simplification, but really, it’s not terribly far from the truth. It will take some time to even approach that sort of scale, but I have high hopes for our architecture and its ability to grow with whatever demand happens to be thrown at it. Games of this sort always seem to either be single player or limited multiplayer, which for me has always been a bit of a downer. I think the world is ready for a skill based space game on a large scale with a persistent world. There have been some that came close, but none of them have really delivered the complete package for me. Hopefully there are several more people out there who feel the same. Brian: Now I’ve noticed some similarities to Jumpgate (RIP) but also some significant differences. First, let’s look at the stars of the show, the spaceships. Rather than being provided a list of specific hulls, it looks as if spaceships will be more modular and customizable. Could you expand upon the ships in the game, such as ship design, specialization and so on? Chris: The game will open with several pre-designed hulls for purchase that will be available from some of the NPC groups in the game. Players will be able to design custom hulls that can then be mass produced via the typical in-game manufacturing processes, but we’re not planning to have a setup where you can just replace the wings on your ship with different ones. The equipment on the ship (engines, weapons, shield, etc..) will be easily swapped out by the individual player, however. Ships really won’t be strictly classed. Some designs will be better suited to some tasks than others, but that’s about it. The plan is to make designing ships and equipment fairly straight forward. You set the size, and a few sliders which determine the attributes of the ship. Then you’re presented with several modular pieces that can be fit together to build the physical representation in the game. The game then takes all of this into consideration, comes up with a shopping list needed to build one, and then saves it into the database as a patent. The player can then shop his design around or built it himself if he happens to have a factory somewhere that can be tailored to building the design. Once the factory is tooled up to produce the item, then it’s just a matter of having the appropriate resources on hand to build it. Hulls will be able to be traded and shipped around the game world just as easily as any other commodity or piece of equipment, provided you have the cargo space on board to carry something that large. Brian: I’m also noticing the game won’t have levels, but rather the ships you can fly are dependent on other types of progression, such as the reputation with specific factions and available licenses. How does the player acquire reputation and licenses in the game so that they may progress to better ships and equipment? Chris: Licenses are initially purchased, and then are advanced by doing the action that it licenses you for. As you gain ability in that particular discipline, you will qualify for the next grade of license, and so on. Achieving particular grades in some licenses will open up new licenses as well. For instance, you might be licensed for mining, and after progressing that a bit, gain access to better mining equipment and mining drones. Brian: I’m not seeing any mentions of factions, but I am seeing mentions of “inhabitants”, such as criminals, gold rushers and empire builders. Are there factions in the game, or are these inhabitants different roles we’ll be able to choose when we create our character? Or, rather, will we be open to making our own destinies, and these are just ideas as to what one can do in the game? Chris: The game is a complete sandbox. When you make your character, we’ll have a few different choices that will give you a particular starter ship tailored for that style of play, but other than that, all of the choices are the same. From that point onward, your choices and actions will decide your fate and define your role. You don’t become a something by deciding to be it. You have to actually get out there and become the role. The game will have several NPC groups that hold territory and operate in the BorderSpace world. As you move out from the starter areas, and begin to interact with them, you will begin to set your alignment with these groups. It won’t be possible to be everyone’s friend, so you’ll have to pick for friends and enemies carefully. Likewise, there will be player groups operating in areas of space that you will have to be equally careful of. Player groups and NPC groups will be largely the same. The major difference is who is running the show behind the scenes. Brian: The economy sounds like it’s purely player-driven, such as needing miners for raw materials, and those materials needing to be made into components and equipment, which is lost from the market through usage and player loss. Could you expand upon how the economy works, please, and how the player can influence it? Chris: You’re pretty close. The economy will start with the raw ore mined from the asteroids in space. These will get refined at various refineries in the game world into simple resources like carbon, nickel, and other elements. These resources can be combined into construction goods like wiring and steel. The next level will combine the above two into produced goods like computers and explosives. Finally, you roll all that together into hulls and equipment. Everything will be tradable on the open market for whatever price someone is willing to pay for it. Loss will happen as ships get destroyed, but things don’t completely disintegrate when they’re destroyed. The player gets a free ride in his escape pod back to the nearest friendly station, but his ship stays behind as a flaming husk tumbling through space working off its leftover inertia before finally coming to rest somewhere in the darkness of space. This leftover salvage will be able to be collected and either repaired (costing money and resources) or recycled into a portion of its construction materials. Items in need of repair will be tradable as well, and through this mechanism you’ll be able to gain access to hulls and equipment that you wouldn’t normally have access to because of alignment. Once it becomes salvage in space, it’s free game for anyone. Equipment that gets repaired will age a bit each time, and the repairs will become more and more expensive as the item ages. Eventually, the item will become worth more as scrap and can be recycled. Brian: It looks as if the player will be able not only to build stations, but also their own little fiefdom, which to me sounds like individual players can set aside territory for themselves…and THAT sounds awesome. Could you expand upon this, please? Chris: Stations are going to be a bit of a mini-game unto themselves. They’re going to require lots of resources and effort to build and maintain, and so it’s really not something that an individual player is going to be able to undertake. The stations themselves will be modular in that groups can outfit their station with lots of different modules like refineries, factories, additional hangar and storage space, power and shield generators, as well as defensive modules. Each module will have its own benefits and requirements a bit like a technology tree, so you won’t be able to build just anything. If there isn’t enough power on hand, then another shield generator isn’t going to do you any good. As for territory, the NPC and player groups will be able to expand their empires outward, and fight over areas of space and the resources contained within those areas of space. Almost everything in the game is going to be destructible, so if someone starts building a station somewhere they shouldn’t be, you have every right to pay them a visit and convince them otherwise. The game is planned to be very dynamic and changing. As the game progresses, the old structures will get destroyed and new ones will spring up somewhere else to replace them. The landscape and political climate of the game will be in continual flux. Brian: In regards to player grouping, it looks like if it’s set up to be a lower tier, such as squadrons, and then a larger tier, such as flight groups made up of smaller squadrons. Could you please explain and expand upon the use of player groups? Chris: Player groups will be the colonizers of the outer rim (known as The Void). Out in the Void, the only law is what the players will tolerate. The Void will start out initially as wild empty areas of space rich with resources. Over time, the player groups will harvest those resources and build stations, gates, and defenses to set up their own areas to be patrolled, defended, and expanded father out into the Void. These groups will then be able to ally together into larger groups for greater numbers and greater access to resources owned by those allied groups. Brian: One thing I loved about Jumpgate is that I spent the bulk of my time mining, hauling and running missions, and barely did any PvP combat. Will BorderSpace allow for this type of “carebear” style of play, or will it be more combat oriented? Chris: There will be a lot of opportunity for mining, hauling, and other tasks of that type within the game. There will also be a job board for players to post work that they need done. Perhaps a group needs something delivered to their station to help complete their latest new module, or someone likes someone else’s shiny new ship and wants to add its twisted husk to their collection. There should be no shortage of stuff to do. Brian: Expanding upon the last question, I’m not finding any mention of missions on the Wiki. Will there be any kind of generated missions for the player to partake in? If so, what kind of missions can the player partake in? Chris: Since the NPC groups will be playing the game similar to the way that the player groups will, they will be generating missions on the job board just like the player groups. We’ll have other missions available as well, but we don’t want to end up in a situation where the best path of progression is to do the same boring mission 50 times until your eyes bleed. You shouldn’t have to grind to get somewhere in a game. You should just have to play the game and progression just happens as a consequence of playing. Brian: It looks as if the game is fairly moddable, as your last dev video explained that the interface can be changed by editing XML files. Could you expand upon how moddable the game will be, and what we’ll be able to fiddle with? Chris: Current plans are for the UI bits mostly. 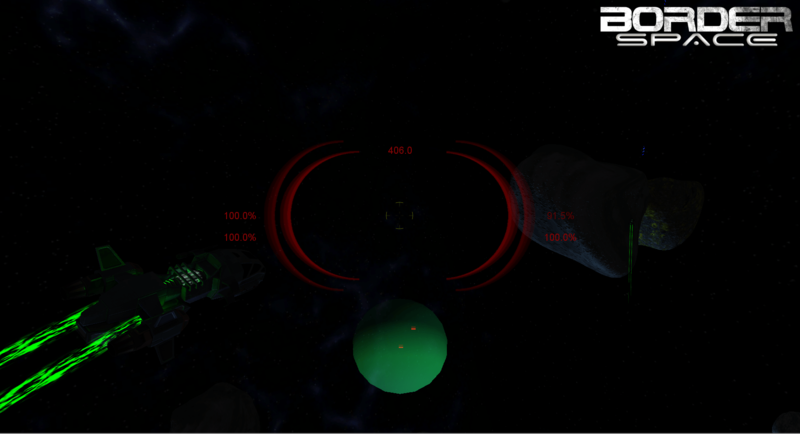 The HUD and the various GUI menus and interface screens. Of course, the modular ship designs are moddable, but not quite in the same way. Sounds are not planned to be modifiable. Other cosmetic changes like ship skins and the like will be available as well. Brian: Finally, what makes you the most excited about BorderSpace, either as its developer or as a fan of space gaming, or both? Chris: I’m most excited to see the world that gets built and how the groups square off into teams in their bid for dominance. Pure combat prowess is not going to be enough to get there since the economy will eventually sap your ability to wage war. The successful teams will need to contain elements of several disciplines to really be a force. I think it’s going to be a very fun world to build. I really can’t wait to see it. I know I can’t wait to see it either. Big thanks to Chris for taking the time for this Q&A, and I hope to bring you more about BorderSpace soon. Thanks for reading, and please enjoy the second screenshot Chris sent me in the small gallery below! Gah, you are so right, sorry about that!! Thanks for pointing it out, and welcome to the blog!